SAEM High School Workshop students give their opinions on songs at iHeartMedia Inc. studios with renowned Pittsburgh radio personality Scott Paulsen. Prospective Point Park University students explored the city — and the fields of sports, arts and entertainment management — staying on campus this year for the annual SAEM High School Summer Workshop. 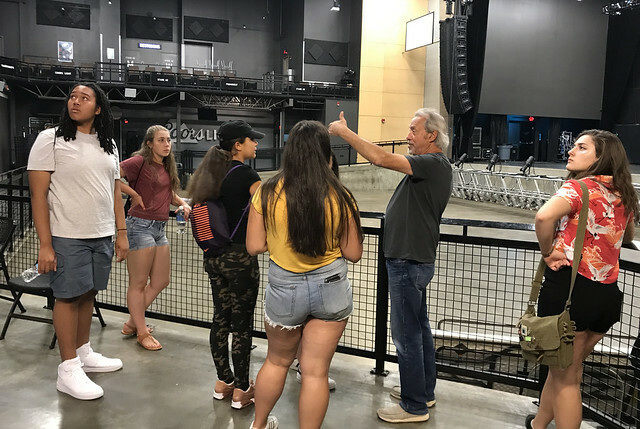 The four-day workshop, held July 17-20, included a variety of career-focused lectures from SAEM full-time and part-time faculty, as well as guided tours of iHeartMedia Inc., Stage AE, PNC Park and Point Park's Pittsburgh Playhouse. "As the students toured iHeartMedia studios, they had the opportunity to see the business that supports the external entertainment that is iHeartMedia in Pittsburgh. That essential backdrop insures and sustains the business of radio," explained Paige Beal, M.B.A., assistant professor and chair of the SAEM department. Beal added: "SAEM majors at Point Park learn in-depth about the business foundation behind all areas of entertainment so we think it's important students at our high school workshops get a preview of this as they tour various venues." Recreational activities mixed in throughout the workshop week included a Pittsburgh Pirates game, bubble soccer, lunch at Peppi's and a movie night in the Point Park Ballroom, organized by Ashley Dobransky, assistant to the dean for the Rowland School of Business. The students also had the opportunity to interact with high school attendees at Point Park's Interactive Multimedia Storytelling Workshop held the same week. SAEM senior Baylee Zimmerman volunteered at the SAEM workshop for the opportunity to interact with prospective students and share with them her passion for the field. "This workshop is so well rounded and hits all aspects of the SAEM major," Zimmerman said. Students from Allderdice, Baldwin, Cumberland Valley, Greensburg Salem, Iroquois, Mt. Lebanon and Pittsburgh Creative and Performing Arts high schools attended this year's workshop. Below are portraits of some of the attendees, along with their feedback. "Since 2012, I've been to at least 60 concerts. I love live music and want to pursue a career in the entertainment management field. I loved going to Stage AE and meeting Professor Ed Traversari. I'm definitely coming to Point Park. This workshop sealed the deal for me." - Taylor Donahue, senior, Baldwin High School in Pittsburgh, Pa.
"This was a great opportunity to check out the SAEM program. My favorite part was touring Stage AE because it is a place I go often for concerts. It was fun to go behind the scenes. This program made Point Park one of my top choices." - Melissa Santucci, senior, Pittsburgh Creative and Performing Arts High School in Pittsburgh, Pa.
"I came to this summer workshop to get a better feel of what the SAEM program offers. Throughout the course of the workshop, I could see that this is going to be a good fit for me and I am really happy about that. I enjoyed going to Stage AE and PNC Park and learning about the business behind performances and other entertainment." - Lucky Tasco, incoming SAEM freshman from Methacton High School in Eaglesville, Pa.
"I'm still figuring out what I want to do so this was a good opportunity to explore my options. I liked the iHeartRadio tour best because it's a place where I think I would enjoy working. I want to work in advertising and marketing management. It's cool how close everything is to Point Park's campus. I'm planning to apply here." - Emily Wargo, senior, Iroquois High School in Erie, Pa.